The Londonphile wandered past this (former) drinking trough positively overflowing with spring blooms on Surrey Quays Road last week and set out to learn more about its history. The Metropolitan Free Drinking Fountain Association (as it was originally known) was formed in 1859 to provide free, clean drinking water to Londoners at a time when the Thames carried water-borne cholera and beer was cheaper than fresh water. The first fountain - complete with drinking cups. 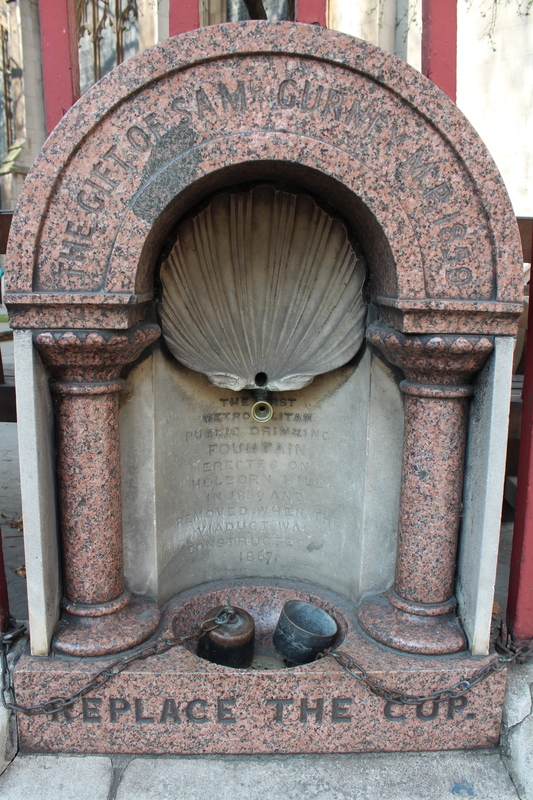 The first drinking fountain to be provided by the Association was set along the wall of St Sepulchre’s Church on Snow Hill (EC1) in April 1859, and was soon quenching the thirst of around 7,000 citizens each day. It still exists today, although it is now located on the other side of the church, on the corner of Newgate and Giltspur Streets. Originally, fountains such as this one generally featured somewhat unhygienic drinking cups, attached on chains. These were later replaced with upward jets of water, not surprisingly due to health concerns. Within eleven years 140 fountains and 153 cattle troughs had been provided by the Association. They had been quick to realise the desperate need for refreshment faced by the many animals both living in and visiting London – many of whom were driven into the capital for days on end, often without water. 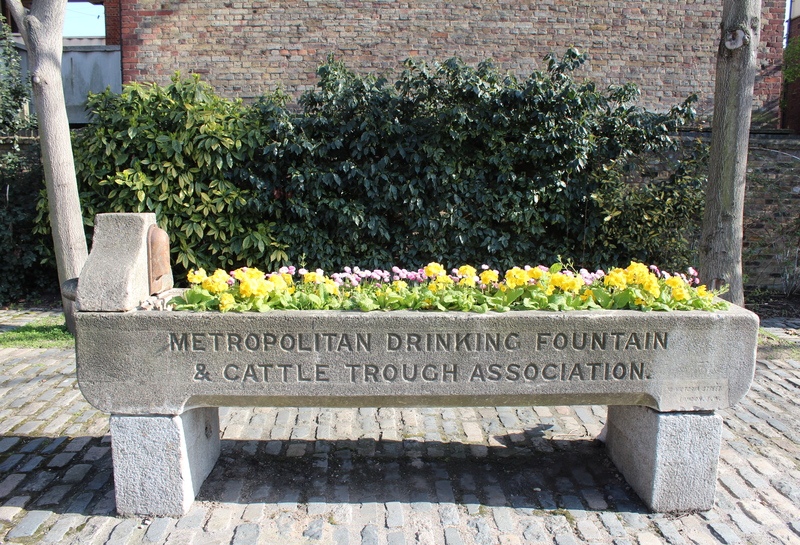 By 1865 most fountains also featured a trough for dogs, and in 1867 the group officially changed its name to the Metropolitan Drinking Fountain and Cattle Trough Association. The Surrey Quays Road trough is a typical granite cattle trough (circa 1900), which incorporates a drinking fountain on one end. Like a number of old troughs, it now serves as a flower bed, and features an inscription of the Association’s old address, 10 Victoria Street London S.W. It has a rather colourful recent history with the original trough having been stolen (you can see a photo of its rather bereft-looking stand here). It was replaced with the current trough – which possibly hails from Kent – in 2010. The Drinking Fountain Association (as it is now known) is still very much active today, especially in the provision of drinking fountains at playing fields and schools, and still receives requests to help thirsty animals. They have long conducted work overseas, especially in developing countries. Fancy becoming a trough spotter? You can find/report your local London trough to http://www.londontroughs.co.uk/ a site which aims to collate all of the remaining troughs in the capital. 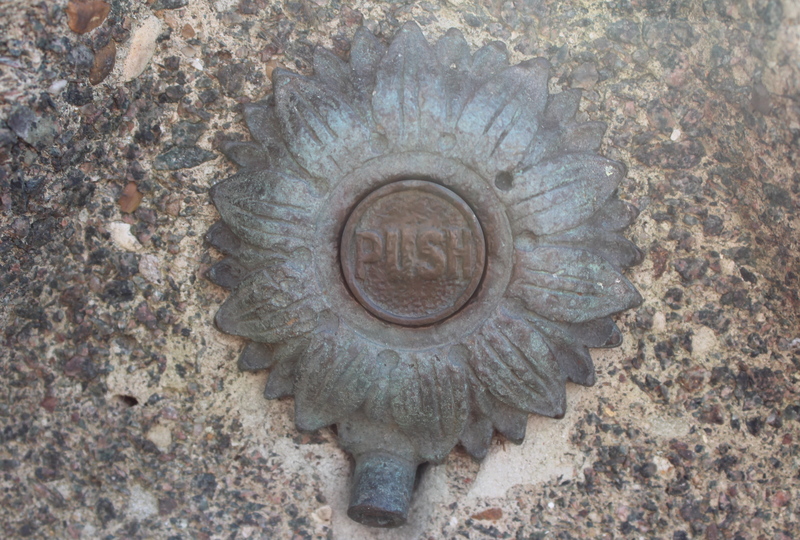 Detail from the drinking fountain on the side of the Surrey Quays Road trough.